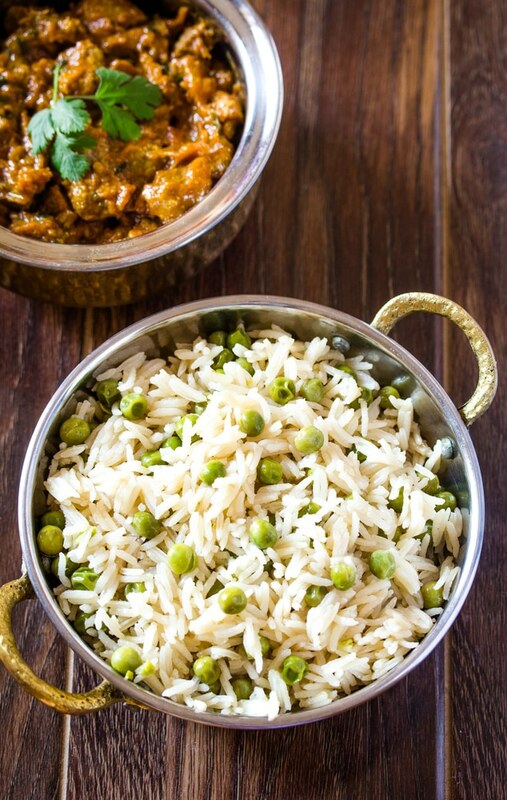 Matar Pulao or Peas Pulao is a delicious Pakistani side dish, that’s ready in just 20 minutes and pairs well with many main dishes such as this Chicken Korma and Easy Chicken Karahi. 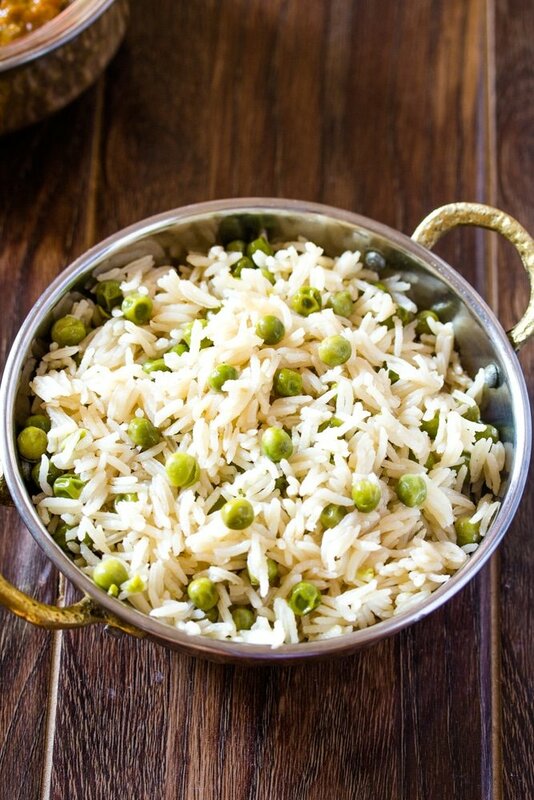 What is Matar Pulao (Peas Pulao)? 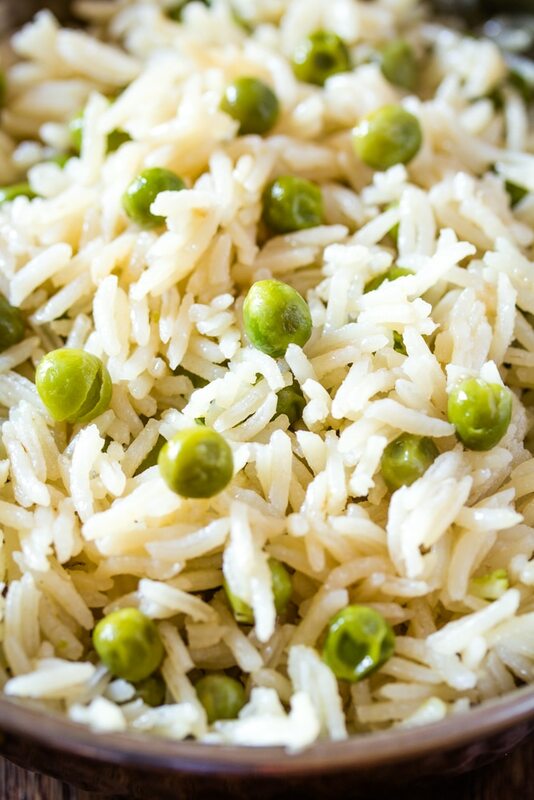 Matar Pulao is basically basmati rice cooked with caramelized onions and peas. A lot of recipes call for aromatic whole spices such as cloves (laung or lavang), black pepper (sabut kaali mirch), and cinnamon stick (dar chini). But I like to keep things super simple (and also nobody in my family likes whole spices in their food), so I just caramelize some chopped onion, throw in some frozen peas, and then cook the rice in a yummy pea onion broth seasoned with the king of seasoning: salt. So basically, if purists were to see my recipes, they’d gasp in shock, because there’s no aromatic spices in this pulao. Pulao is ALWAYS made with whole spices. 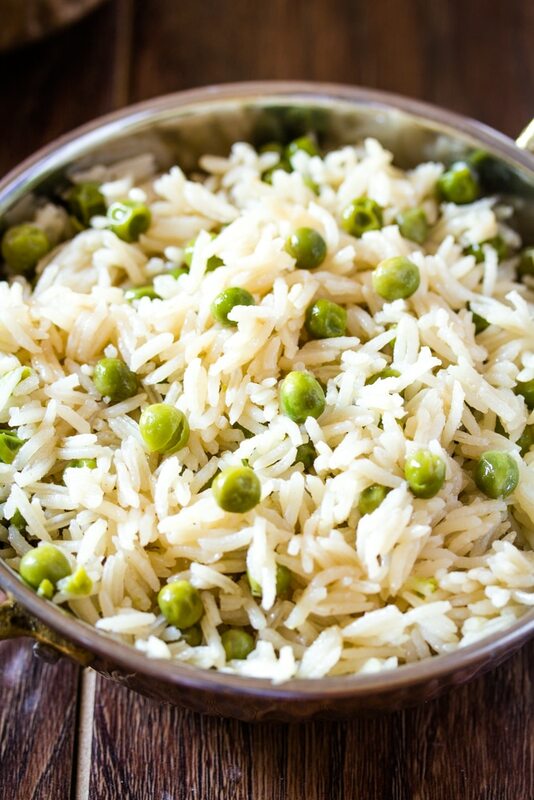 I don’t know about you, but I love making my life simple and enjoying the simplest of flavors…like this matar pulao. Whenever I’m in a rush to cook (which I am always these days, since my almost 1 year old likes to hang onto my legs while I cook for fun), I look for quick and easy recipes that do not compromise on flavor. In my world, it’s a very sad day if we don’t get to have at least yummy food, even if it’s the simplest it can get. Matar Pulao is one such recipe, which I make so often, because A.) it goes so well with many of our Pakistani and Indian Recipes, and B.) 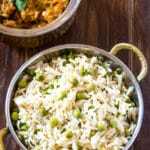 I love the simplicity of matar pulao and the beauty of a few ingredients that result in such a scrumptious, soul-satisfying meal. The other day, the kids were driving me crazy, and I couldn’t be bothered to cook. But I didn’t want to order in either, so enter a bag of frozen peas, basmati rice, and a humble red onion. A touch of seasoning, and about 20 minutes later we had a steaming pot of delicious peas pulao. I served that matar pulao with this cucumber raita and aloo tikki, and it turned out to be such a delicious and comforting meal. Sometimes, simple is the best. Less is more. You know how that goes. So I hope you try this super duper easy recipe, and then we can talk about how awesome it is! Heat oil in a pot and add the chopped onion. Fry until the onion is golden brown. Add a splash of water (about 1-2 tablespoons of water) and cover the pot with the lid. This helps the chopped onion release it’s colour and that’s what gives the rice a nice color. Add the peas and salt, and cook for 3-4 minutes. Add the water and cover the pot with the lid. Bring the water to a boil, and then add the rice. Cook the rice on medium-high heat until the most of the water has evaporated. Lower the heat to the lowest setting, and cover the pot with the lid. Let the rice steam for 5 minutes or so, and then remove from heat and fluff up the rice with a fork.